Before you start thinking that's just one spot off the 68 teams who make March Madness, 32 bids are awarded to conference tournament winners. What the Razorbacks need is to be in the top six or seven in the SEC, which means finding a way to claw themselves ahead of Auburn, Florida, Mississippi State and Alabama in the standings. The Razorbacks popped out of a slump and finished strong the past two seasons, and there were some indications in the 67-64 loss at Texas Tech on Saturday they might be about to come together. 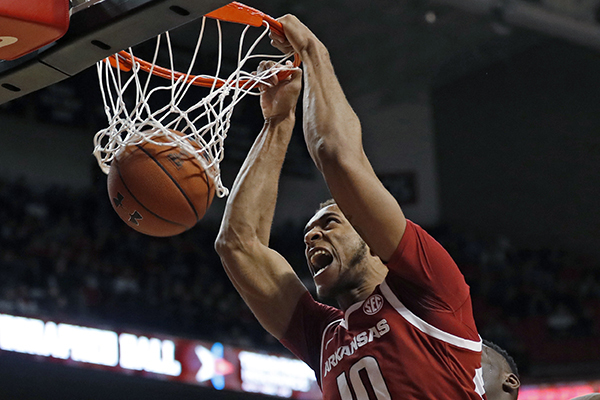 The Hogs led 33-30 at the half and had a chance to tie it at the end, but offense has not been a resume builder for the Razorbacks this season. It might be a tall order to ask them to win at LSU or Kentucky, but the Gamecocks and Tigers have lost four home games, and the Commodores five. Arkansas played pretty well Saturday, but like in five previous losses, the Hogs didn't find a way to win with the game on the line.